Why does Canon fit its DSLR straps with this small cover? 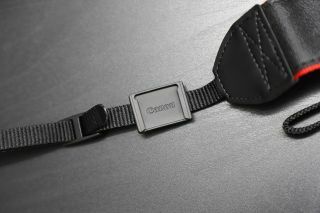 For years, Canon has included a small cover on the straps that come with its DSLRs. It’s easy to miss and even if you do spot it, you may just assume that it's only there for decoration. However, this does actually serve a purpose. So what does it do? Well, believe it or not, it’s actually for your viewfinder. It's designed to help you out when capturing long exposures, or for other occasions where you may be using a tripod. What does the Canon eyepiece cover do? When you capture a long exposure, or place the camera on a tripod for any other reason, it’s quite likely that your face will no longer be directly behind the camera at the point of the exposure. When this happens, it becomes easier for light in the scene to enter the camera through the viewfinder. This then means that there is light entering the camera through both the lens and viewfinder. The problem with this is that it can affect your camera’s metering system. Ordinarily, the camera simply sees the light coming through the lens and the metering system uses this to make a judgement on how the image should be captured. If the camera senses more light than it should, however, it may choose to expose the scene differently to how it ought to, were it only receiving light through the lens. In this case it’s likely to underexpose the scene, as it senses more light than it should. The eyepiece cover acts as a barrier, stopping any extraneous light from entering the viewfinder. Once this is in place, the camera shouldn’t be affected by any light other than that entering the lens. To use this, all you need to do is push the small eyecup that should already be around your viewfinder upwards until it comes away from the camera. Then, simply slide the cover on your strap down in its place. You don’t even need to take it off the strap to do this, although you should make sure that you don’t lose the eyecup you’ve removed, as you'll need to fit this back on the camera once you're done. If you have a DSLR and you're using live view, or recording video, you don’t need to worry about this. The reason for this is that the mirror inside your camera has been raised up so that the sensor is exposed to the scene. This in turn blocks off your viewfinder so there is no risk – and if you look through it, you'll see it's completely dark. Likewise, this approach is not necessary with a mirrorless camera, or whenever you’re using an electronic viewfinder (EVF). Other DSLR manufacturers don't tend to fit their own straps with the same kinds of covers, although Nikon does have a similar cover that's separate to the strap itself. On some of its professional models, Nikon actually builds a viewfinder blind into the viewfinder itself, which serves the same purpose. This can be conveniently flicked into place as and when required, using a lever to its side.